About HDCP: Note that this monitor does NOT support HDCP. Although not critical now, this could become serious with the release of Windows Vista in 2006. We recommend that you read our article on the subject to better understand how HDCP support may affect you. As a monitor manufacturer, the widescreen 23-24” market segment is tricky because it is firmly in “prosumer” territory. Prosumers want high-end equipment, but they aren’t quite willing to pay for it. However, there are a lot of prosumers and they are willing to pay a price premium over the normal consumer segment. The first wave of monitors, made by such manufacturers as Apple and Sony, cost well over $2500 and were targeted at high-end, low-volume customers. Lower cost options were available but they were not dramatically cheaper. As with any relatively high-end computer product, the prices started to come down and in 2004 a number of manufacturers including HP and LG introduced 23” widescreen panels well below the critical $2000 price point. The HP and LG panels, however, had not made any feature sacrifices, and in fact, offered features the Apple and Sony panels did not support, such as Picture in Picture (PiP) and component input. HP also offered a media-oriented version with built-in speakers. Then, probably due in large part to HP’s success with its 23” widescreen panel, word spread in January of 2005 that Dell would be introducing a 24” monitor. The 2405FPW would be based on a Samsung panel, and would be introduced at the truly amazing price point of $1200. The HP and Apple offerings at the time were hovering above $1600. This critical price point of $1200 meant that a prosumer could get a fast new workstation and a giant monitor without breaking the bank. A few months later, Dell brought its panel to market in full force and the prices of 23-24” panels crashed over the course of a few weeks. 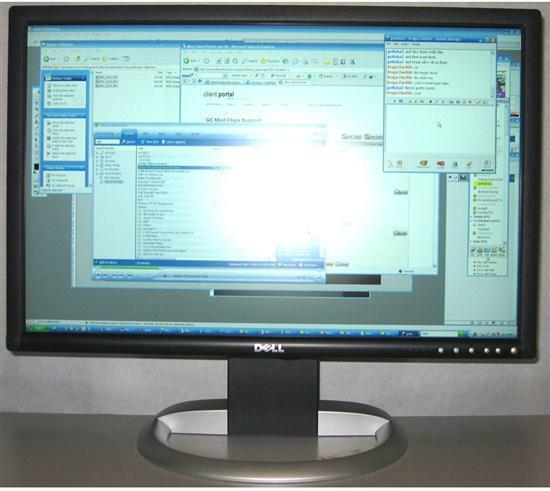 Dell did what Dell does best and no sooner had it introduced the panel at $1200 but they almost immediately began offering coupon deals that brought the monitor below $1000. Then in July the price was dropped to $959 and further coupons brought the price well below $900. As of this writing, the HP 23” panel is available for $1035. The Dell 2405FPW is built around a 24” Samsung panel, as are many Dell panels, and features the understated, if not bland, styling Dell is known for. Dell claims a fast 12 ms response time making it a strong contender in precision, video, and gaming tasks. Like most of the 23 and 24” panels, the 2405FPW sports a native resolution of 1920x1200 – the maximum resolution that the DVI-D video connection can support. The panel also features some nice extras, such as a built-in memory card reader and 4-port USB 2.0 hub.